With every new generation of their people-movers, Toyota has taken the game forward by massive leaps. We saw it when they replaced the simple, boxy but effective Qualis with a modern and upmarket MPV, the Innova; the recently introduced Crysta takes the story forward with a premium air that makes the older Innova feel a bit rudimentary in comparison. The promise remains the same as Toyota replaces their much admired SUV, the Fortuner, in India. However, our expectations were raised even higher at the media drive event as Toyota officials spoke of benchmarking the Fortuner against the Prado during development stages! We got a day with the petrol automatic and diesel manual variants to get a sense of just how much of a step forward the Toyota SUV really is. Our day started in the petrol variant of the Fortuner. Right from when you crank it over, you know why petrols are apt for luxury. This four-cylinder engine settles into a quiet and smooth idle, and sitting inside the cabin you can’t even make out it is turning over. On the narrow streets of Kochi, we ambled along at moderate speeds and the refinement continued to impress. Navigating through the erratic traffic was made all the more calm thanks to the six-speed automatic gearbox. Driven at this pace the gearbox shifted smoothly and with reasonable rapidity. As we got to the more open roads, the driving became a bit faster and more urgent. To pass the vehicle in front, the engine had to use upper reaches of its rev-range. The use of dual variable valve timing helps widen the power band, but the flow of punch feels just a bit tame in the mid range before picking up steam past 4000rpm, heading on to a near 5800rpm limiter. At high rpms the engine is audible in the cabin, but vibrations are almost non-existent. The six-speed gearbox can be asked to toggle ratios through the paddles on the steering wheel. The responses have a slightest hint of lag which will be irksome only when driven in a tearing hurry. The petrol engine will be available with a 5-speed manual transmission, however, there is no all-wheel drive equipped variant on offer. Our second half of the day was spent with the 2.8 litre four-cylinder turbo-diesel engine. This engine is primarily a Fortuner-focused engine that has also been used for the Innova. As a result, it is in a more potent state of tune here, generating a solid 450Nm of torque when coupled with the six-speed automatic. However, the six-speed manual version that we were driving makes do with 420Nm, which is still a whole chunk more than the 343Nm dished out in the Innova. The results are quite plain. I stalled it. The reason? Having had just hopped out of an automatic my left foot was a bit lazy, and the spread of torque was so good, that I didn’t feel the need to change gears while driving around. That was until we almost came to a standstill. There’s no doubting it the diesel feels very potent. Torque is available in plenty right from 1000rpm. The brawny SUV drove up slopes with zest even on a light throttle, so much so that you could even shift up to a higher gear half way through the climb! The engine feels really strong between 2-3000rpm, with enough usable power even past the 4000rpm mark. As a result the Fortuner feels much easier and nicer to drive. No doubt, the revised final drive ratios help the Fortuner make up for its additional heft. The Fortuner continues to be built around a ladder frame chassis with a body on top. While this is a simple and rugged design, it isn’t ideal for driving dynamics as it raises the kerb weight and the centre of gravity. Nonetheless, the new chassis, with greater rigidity and larger diameter dampers, make the Fortuner more enjoyable to drive. Body movement is well controlled over bumpy surfaces and even around corners. On the road, the Fortuner blunts nasty potholes and takes the thunk out of most boulders that you encounter off-road. As you would expect high speed stability is impressive too. The only downside to the setup is that rippled tarmac can be felt clearly inside the cabin. This jiggling sensation was less obvious in the diesel 4x4 variant of the Fortuner. Its higher kerb weight may have had a part to play in that. The diesel variants of the Fortuner can be had with all-wheel drive systems. But, this time around it isn’t a permanent all-wheel drive system and so you can drive around in four-wheel high mode on tarmac. Shifting to four-wheel low doesn’t require you to struggle with a clunky lever, instead you just need to turn the rotary dial for the shift-on-the-fly system. This splits torque between the front and the rear axles in a 50:50 ratio. As would be expected of a tough SUV there is a low range as well, and can be engaged when at a standstill. Interestingly, the new Fortuner’s ground clearance figure is said to be an ARAI claimed 184mm, significantly lower than before. The Fortuner uses a variety of technologies to enhance the driving experience, comfort and convenience. The petrol and diesel engines, manual and automatic, come equipped with Power and Eco modes. In Power mode, throttle response is more aggressive for quicker responses. In Eco Mode the throttle response is dulled and the air-conditioning is softened to improve fuel consumption. The manual gearbox equipped Fortuners also pack a feature, Intelligent Manual Transmission, that raises the engine rpm during gear shifts to keep the speed from dropping and hence making the drive smoother. To improve comfort, the diesel’s Pitch & Bounce Control system reduces engine torque as you navigate bumps or potholes. The all-wheel drive equipped SUVs also offer descent control to help while driving down steep inclines in off-road conditions. In terms of safety equipment, the Fortuner offers 7 airbags, ABS, EBD and stability control with brake assist as well. With the Prado as the benchmark, the changes for the Fortuner started at its very core. The chassis, which continues to be a ladder frame, had to be built anew. Thicker steel and more reinforcements were incorporated to boost refinement and improve the driving experience. This also resulted in a cascading changes to the body, the driveline, the suspension and other components. As a result the development vehicle weighed a lot more than the outgoing Fortuner. However, the use of tensile steel and other changes helped bring the number down to 200-250kgs for the production version. One thing is for sure, the new Fortuner stands out. In terms of size it is longer by 90mm, and 15mm wider than its predecessor, even though its wheelbase remains unchanged. The maximum height is 15mm lower than before, but that has done nothing to reduce the Fortuner’s ability to clear the traffic ahead. Although, people will be tempted to stop and stare for a bit. The look is futuristic and dramatic, highlighted at the front by the slim full-LED headlamps and the complex bumper. The design is distinctive from the side, too, as the window line kicks up after the second row windows before flowing into the rear. The tail lamps fan out, rich and relaxed, with the LEDs making the statement more vibrant. In the past, what irked most Fortuner owners was that despite spending significantly more than the asking price of an Innova, the interiors were the same. Even the all-new Fortuner shares quite a bit with the Innova, but the dashboard design is different and there is a greater sense of luxury here. Toyota has made sure that the contact points use soft touch materials, like the faux-leather on the cooled glove box, the armrest for the door pads and the velvety material for the sun visors. The 8-way adjustable driver’s seat is supportive and the driver is also treated to a crisp and information packed LCD display in the instrument cluster. This might seem a bit shallow, but the LED cabin lights look really cool although the lack of a sunroof option will antagonise some buyers. However, some things don’t feel all that satisfying. Some plastics like the dash top are the simple and tough variety, and the piano black bits look a bit poorly finished, too. The colours on the touchscreen aren’t rich and the controls for the air-conditioning system feel a bit old school. In the second row, unlike on the Innova, the Fortuner doesn’t get picnic trays; however, there are hooks for bags. Passengers are treated to supportive seats and ample space. Sliding the second row can help optimise the space so that there is enough knee-room to accommodate adults in all three rows. However, the headroom in the third row will be tight for taller passengers and even shorter passengers will find it a bit claustrophobic as the headrest for the second row block the view and the roof lining that protrudes down, hems the view ahead even further. Even with the third row in use, the Fortuner offers ample space to pack for a weekend trip. With the seats flipped up, manually, there is space in plenty for much longer trips! With the all-new Fortuner, Toyota has addressed weaknesses of the previous generation, and made this family of SUVs even more appealing. Richer interiors, a calmer cabin, more powerful engines, a variety of drivetrains and a more satisfying driving experience make the Fortuner a much stronger offering. While most of its shortcomings aren’t deal breakers, we look forward to examining the ride quality on familiar roads soon. Toyota’s hold on the SUV market has remained tight despite the arrival of newer competition. 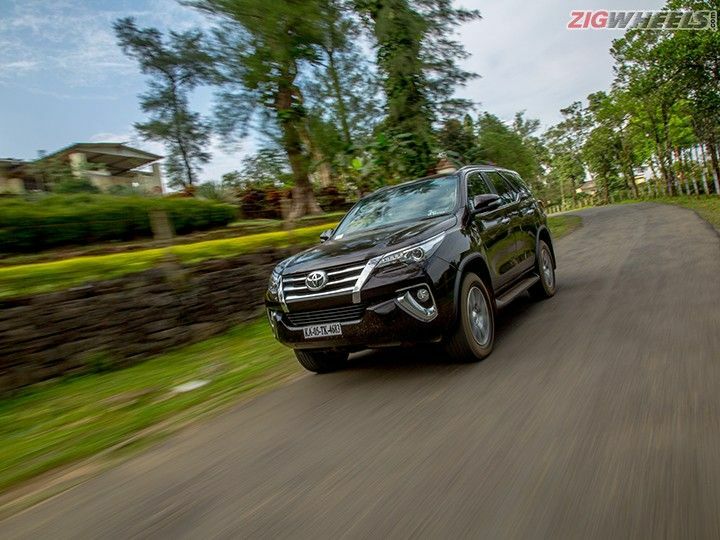 Now, the second-generation Fortuner looks set to cement that position even further. Share your experiences with Fortuner?